Be Safe & Be Seen in Total Darkness. The HALO™ Reflective Helmet Band is a 1 - 5/8" high closed loop of neoprene that is completely covered with Scotchlite reflective material. The HALO™ stretches around the base of motorcycle and bicycle helmets and stays in place without the use of any glues or adhesives. 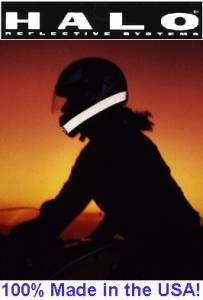 The HALO™ is used and endorsed by the Motorcycle Safety Foundation, the leading motorcycle safety instruction organization in the United States. The HALO™ Helmet Band is also purchased by mining suppliers all around the world. How these are being sold and or marketed we have no control over & thus offer no endorsements. Except no substitutes. Poor quality copies are available and fail without warning. HALO Helmet Bands are tested, approved & warranted for Motorcycle and Bicycle use only. They can be used for many other applications as well, but MFI has no testing data nor recommends using them unless the user has fully tested the product for their specific applications & as such assumes all responsibility for their use. This product should NEVER be used near or around any type of high heat. NEVER use this product for ANY FIRE FIGHTING applications. This product is made of neoprene which has a very low flash point. Neoprene is rubber and will ignite, melt and cause serious harm and even death if exposed to a flame or heat source. DEALERS BUY DIRECTLY FROM MFI! We are the manufacturer of this product and can offer you the best pricing. Discounted prices are based on volume (next tab). Prices below will be adjusted manually when we process the order. You will be charged the amount stated below, NOT the amount in the Check Out Area. Great for the mining industry! We buy these by the thousands and they sell so well... Perfect fit everytime and I had no idea the same company made these (we have been buying for 7+ years) as the company who makes SIG 556 parts... I see the super quality in all thier products!! Must work... not even a single near miss since buying this. I even have other bikers ask what is that thing glowing on your helmet? Keeps me seen on the street! I owned one of these for over 5 years when I used to ride my '92 Nighthawk. Being seen was never an issue since noone else knew about it nor wore one. I'm in old people land (FL) so being seen is CRITICAL. People always kept their distance since I communicated and knew how to ride.